I wrote this guide for online shopping on the localized version of eBay in Myanmar (Burma), about shipping and delivery, Myanmarese kyat, etc. Online shoppers in Yangon, Mandalay, Naypyidaw and elsewhere, or those who want to buy something and have it sent to Myanmar can use the “global eBay version”. 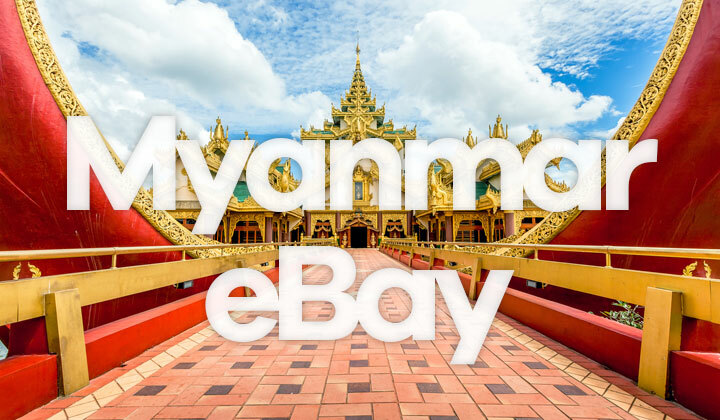 Even though there is no dedicated eBay.mm website, it detects your country location and serves a localized version with relevant search results when in Myanmar. Also those outside the country, can shop there. Follow these instructions. In or outside of Myanmar (formerly known as Burma), you can use these tips to customize your online shopping experience. More on shipping below. An often overlooked choice is to shop among the many eBay sellers in Myanmar, for local, cheap and fast delivery of course. These are the steps. Step 2. Fill in search with an item you are looking for. Step 3. Scroll further down on that page, until you see the country selection that says “located in”, choose “Myanmar” from the drop-down list. Step 4. Search will yield results from Myanmarese sellers only. Perhaps the most popular way for online shopping in Myanmar is to search amongst Asian sellers, for competitive pricing and shipping costs. Step 2. Search for an item you are looking for normally. Step 3. See the options on the left side, which include a setting to change to another country region such as Asia, North America (USA), Europe, etc. The eBay marketplace supports a range of shipping, and delivery options to Yangon, and elsewhere in Myanmar or Burma. But this supports on the seller. However, when you are located anywhere in Myanmar and eBay detects your internet connection as such, all searches will show results based on shipping support. Also this includes the automatic calculation of sending rate estimates. Therefore using the advanced search options above is not required. For those, located outside of the country can change their country settings by sining in and proceeding to settings, or sign up if you don’t have an eBay account yet. Shopping within Asia for example, often low-cost shipping methods are supported. But you can contact international sellers, and ask them for customized delivery options. As using fast and secure courier services is recommended for expensive items. Supported shipping destinations include; Myitkyina, Naypyidaw,Pyay, Mandalay, Pathein, Mawlamyine, Yangon, Taunggyi, Monywa, Bago & elsewhere. Most common method of payment is by PayPal or debit card, at times credit cards are also used but more rare nowadays. And despite the lack of support for Myanmar kyat on the e-commerce website, you can pay with kyat converted from USD. Prepaid Visa and Mastercard is now a common method of payment. Simply charge kyat into your card, and payments will be subtracted by using the latest US Dollar exchange rate. The site shows all pricing in USD. You can also use the popular marketplace to sell or auction items, either locally or by using the global shipping program designed for international sellers. This is likely the easiest, and most convenient method of entering the Myanmarese e-commerce market if residing abroad, with a modern English platform. What’s your take on the eBay seller/buyer scene in Myanmar? All questions on online shopping there are welcome. Your visit and potential share if much appreciated. Not forgetting the fact that some of the posts on my blog have affiliate links in them, which promote and support both Elftronix and the author. Cheers.